Never Alone, the beautiful puzzle platformer based on the Alaskan Inupiaq folk legend of Kunuuksaayuka, is getting an expansion. 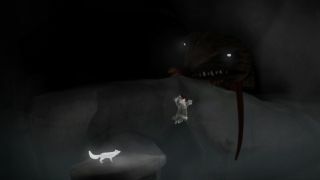 Never Alone: Foxtales will add three new levels to the game, and in keeping with the original they will be sprinkled with unlockable "Cultural Insight" videos. This time the studio is drawing from the "Two Coastal Brothers" folktale, but Nuna and Fox will return as playable characters. "Spring has come to the Arctic as Nuna and Fox climb aboard their umiaq (a sealskin canoe) and take to the waters of the coasts, rivers and lakes of Northwest Alaska," the studio writes in its announcement. "They’ll travel across open seas, swim through the ruins of a sunken village and paddle up the Noatak River on a mission to rescue a new friend." The expansion will release July 28. Check out the expansion trailer embedded above, or check out Edwin Evan Thirlwell's review, where he describes Never Alone as a "beautiful, fascinating exploration of a world that may soon be nothing more than fantasy."